The 10th Weather Squadron was initially activated at Derrick Field, Maryland, on the 24th of June of 1942. It was assigned to the 10th Air Force in New Delhi, India in January 1943. The unit operated with Col. Philip Cocharn's 1st Air Commando Group throughout the China-Burma-India (CBI) theater supporting both Brig. General Orde Wingate's Long Range Penetration Group, the Chindits, and Brig. Gen. Frank Merrill's "Marauders". The squadron made use of small weather teams that were inserted deep into enemy territory to provide weather observations. In August of 1944 Gen. Curtis Lemay authorized the unit to begin training Chinese guerillas in basic weather observation skills. By VJ Day the 10 WS was the largest weather squadron in USAF history, with over 2000 personnel on its roster. On the 16th of June 1966 the 10 WS was reactivated at Udorn Airfield, Thailand and tasked with conducting combat operations in Southeast Asia. The squadron was also tasked with providing support to US special operations units operating in the same theater. They accomplished this by establishing clandestine weather observations stations, and providing weather observation training to indigenous personnel. 10 WS special operations weather teams also provided critical weather support to US special operations forces involved in Operation Ivory Coast, the raid on the Son Tay POW camp. On June 30th 1972 the squadron relocated to Nakhon Phanom Royal Thai Air Force Base (RTAFB), and continued to conduct operations until its inactivation on September 30 1975. On October 1 1996 the squadron was reactivated as the 10th Combat Weather Squadron (10 CWS) and assigned to the 720th Special Tactics Group (720 STG) of the Air Force Special Operations Command (AFSOC). The 10th CWS mission is to operate with US Army Special Operations Command forces. The squadron employs Air Force Special Operation Weather Commandos who provide a full suite of meteorological and environmental data in conditions ranging from hostile to permissive. Squadron members augment their specialized weather forecast and observation skills with static line parachuting, survival and small unit tactics. Select members receive training in military freefall parachuting, SCUBA, Pathfinder, Ranger skills, mountain warfare training and air assault. The squadron is comprised of five combat weather detachments and one operating location, which operates with US Army Special Forces, Rangers and the 160th Special Operations Aviation Regiment from Fort Campbell, Ky.
**NOTE: The 10th CWS is the only weather squadron in the USAF with the "Combat" designation in its title - An important and obvious distinction to those who are familiar with the demanding mission of these men. The 10th Weather Squadron was initially activated at Derrick Field, Maryland, on the 24th of June of 1942. It was assigned to the 10th Air Force in New Delhi, India in January 1943. The unit operated with Col. Philip Cochrane's 1st Air Commando Group throughout the China-Burma-India (CBI) theater supporting both Brig. General Orde Wingate's Long Range Penetration Group, the Chindits,and Brig. Gen. Frank Merrill's "Marauders". The squadron made use of small weather teams that were inserted deep into enemy territory to provide weather observations. In August of 1944 Gen. Curtis Lemay authorized the unit to begin training Chinese guerillas in basic weather observation skills. By VJ Day the 10th WS was the largest weather squadron in USAF history, with over 2000 personnel on its roster. 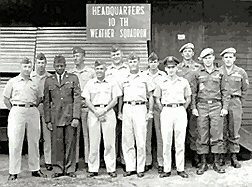 On the 16th of June 1966 the 10th WS was reactivated at Udorn Airfield, Thailand and tasked with conducting combat operations in South East Asia. The squadron was also tasked with providing support to US special operations units operating in the same theater. They accomplished this by establishing clandestine weather observation stations, and providing weather observation training to indigenous personnel. 10th WS special operations weather teams also provided critical weather support to US special operations forces involved in Operation Ivory Coast, the raid on the Son Tay POW camp. On June 30th 1972 the squadron relocated to Nakhon Phanom Royal Thai Air Force Base (RTAFB), and continued to conduct operations until inactivation on Sept 30 1975. On October 1 1996 the Squadron was reactivated as the 10th Combat Weather Squadron (10th CWS) and assigned to the 720th Special Tactics Group (720th STG) of the Air Force Special Operations Command (AFSOC). "Thor's Legions: Weather Support to the U.S. Air Force and Army, 1937-1987"